is the supplier of Starbucks and Wal-Mart as well as famous galleries and original artists in US and EU, is big art company wholesales fine art, oil paintings, portrait paintings, artworks from photos, and famous artists paintings. 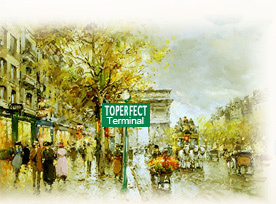 Toperfect, the end to your hard journey of searching for China paintings companies! Founded in 1995, Toperfect ([ˈtɔpəfikt]) means Top & Perfect, is the supplier of Starbucks and Wal-Mart as well as many famous galleries and original artists in America and Europe. Our company art is elegant oil painting, watercolor, acrylic painting, gouache, pencil sketch, pastel, wax crayon, and charcoal drawing. Toperfect art company is famous for our talented artists to support monthly output of more than 10 containers' stretched or framed paintings, 2,000 pieces of high quality paintings, and over 30,000 pieces of paintings in medium and commercial quality. Toperfect's sole websites are www.OilPaintingFactory.com/Toperfect.com in America (www.kunst-gemalde.com in Germany and www.peintures-tableaux.com in France). Any other websites with domains that similar with "toperfect" or "**factory" such as "toperfectart.com" are frauds. For more information please visit Yahoo Punish Pirate Websites. The copyright of scripts in this website is owned by Toperfect art company. Toperfect reserves the manual scripts of original version. Toperfect will take appropriate legal action in the piracy and infringements of copyright. Top 10 reasons why you should choose Toperfect paintings company? Instead of becoming a small and simple "copy shop" with low-level cultural sense, Toperfect aims to be one of a few Chinese paintings companies who have the ability to develop own original designs and reproductions with the same quality as museum collections for collectors. Having studied the culture of each country in different periods, we endeavor to explore the future of fine art in order to create more elegant artworks to keep our customers remaining to be the competitive art companies in their local market. Toperfect is the only China art company who works with academic teachers and professors from the key academies of fine art designated for the state key construction. You can be sure that the Museum-Collection oil paintings by famous artists are 100% copies of the originals. You also can request our famous artists to reproduce in their own styles for collection. We use good painting materials and hire talented artists to work for you. Few paintings companies use certified paints on linen canvas for your art, but we can promise you that. There are over 1,000,000 oil painting factories and art companies if you search the internet. All of them claim to be “leading", "biggest", or "largest" companies, but how could you tell which is true? We are the only China painting company which shows you the video of our facilities like workshops, showrooms and offices. Compared with pictorial and literal introduction, video is the most credible one. So you needn't worry about the safety of your money. You are warmly welcome to visit Toperfect art company. Your visit will surely promote our mutual understanding and facilitate our communication. Let's join hands in mapping a bright future. During the past 10 years before 2006, we were the supply of goods for many paintings companies in the world. At the same time, we have been striving to set up an efficient management system with more than 30 workshops/factories of paintings and frames. With the aim to sharpen our competence, we update our management system in 2003 by incorporating offices, workshops, galleries into the art company -- Toperfect. We may satisfy your needs of small quantity, fast shipment, and irregular sizes. Most China suppliers don't supply stretched and framed paintings in big size, but we do! Our trademark has been registered for copyright protection in USA and Asia. Our Website https://www.oilpaintingfactory.com is also protected against piracy and infringement. Broadcast TV once gave a positive report on our company art:"quality is better and in a relatively low price" (translated from French) May 2009. We don't just orient our business strategy towards profits, but also superb brand, artistic taste and services (as the name Toperfect suggests). To materialize this strategy, we choose fine painting materials and employ excellent painting artists. We would like to promote business ties with you on a mutually beneficial basis. Our R & D team is composed of young artists whose responsibilities cover exploring new skills of oil painting and acrylic painting, new paintings sample as well as other art products. Our company art is timely updated including new samples of oil paintings, and other art & crafts products. Toperfect art company will offer you sample CD of our original artworks without copyright protected watermark on them. We’ll also offer you formal Copyrights Authorization so that you can promote our original fine art in your local market, and you will be approved to put our original paintings on your website, brochure, etc. We commit ourselves to civic activities, donating tens of thousands US dollars to art education and sponsoring poor students of art colleges. Meanwhile, we also make every effort to host shows of original paintings for Chinese young artists in collaboration with the government. This effort helps to find young talented artists oil painting and has won us fame. The picture shows the itinerant show of "Original Paintings of Young artists". Lewis L., the director of Toperfect Art and Toperfect Design. He started Toperfect engaging in the export-oriented economy of mass art and popularizing original painting artists in international market. In the aspect of original art, he advocates the creative principle of “Theme and Technique of Individual Characteristics”, opposing the practice of restless plagiarizing. And he is among the early domestic forerunners of exploring and implementing the mode of “Mass Series”. “Original Extension of Quality and Development of Marginal Industry” and after an insightful investigation and research, he wrote “The Industrial Report of China Oil Painting in 2006----What Course to Follow”. During the recent years, he has started the first professional online gallery together with offline design and popularization in China, which aims at popularizing the original artists in the international market and promoting the communication between original oil painting with world culture in both artistic aspect and commercial aspect. * Peter Chen, Quality Engineer of Toperfect paintings company. 1973 Born in Putian city, Fujian. 1995 Graduated from Fujian Crafts&Fine Arts College. 1997 Original work Watch Drama got silver medal at Fujian Youth Arts Exhibition. Vice-president of Association of Putian Oil Painting of the city Since 2007, and director of Fujian Artists Association of the province since 2009. * Steve Liu, Quality Engineer of Toperfect art company. Graduated from Fine Art Department, Xiamen University. Original Gulangyu Scenes was collected at Xiamen Museum. As teacher in Putian Arts&Crafts College from 1998 to 2003. Vice-president of Xianyou Oil Painting Association of the city Since 2008.